Card Text Play: Take control of an enemy artifact. While under your control, if it does not belong to one of your three houses, it is considered to be of house Shadows. What happens to the controlled artifact if Sneklifter leaves play? Nothing. 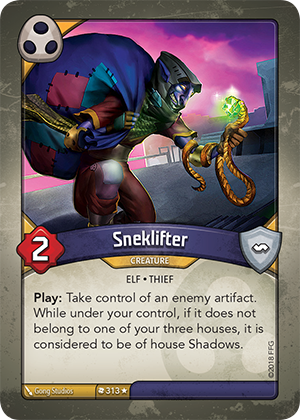 Sneklifter creates a lasting effect on the artifact, which is active until the artifact itself leaves play (i.e. when it goes to the owner’s appropriate out-of-play area).